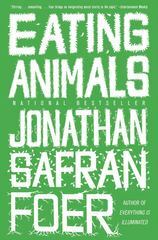 Eating Animals 0 Edition Like many young Americans, Jonathan Safran Foer spent much of his teenage and college years oscillating between enthusiastic carnivore and occasional vegetarian. As he became a husband, and then a father, the moral dimensions of eating became increasingly important to him. Faced with the prospect of being unable to explain why we eat some animals and not others, Foer set out to explore the origins of many eating traditions and the fictions involved with creating them.Traveling to the darkest corners of our dining habits, Foer raises the unspoken question behind every fish we eat, every chicken we fry, and every burger we grill. Part memoir and part investigative report, Eating Animals is a book that, in the words of the Los Angeles Times, places Jonathan Safran Foer "at the table with our greatest philosophers."